WOW. This is not the country we were exposed to in the 80's and 90's through movies and TV shows. What stood out the most to us is how modern and advanced the country is. Nancy and I had the privilege of spending 12 days in Colombia from April 6 - 18. Our friends Ricardo and Angela recently moved back to Bogota from Calgary and invited us to come for a visit. I will say we were a little bit apprehensive because of the concerns over the years, however, our fears were quickly put to rest once we arrived. Here's a recap of our trip. Bogota is Colombia's largest city and is located closer to the middle of the country. It's a city of 13 million people and covers about the same land mass as Calgary, so that's a lot of people in a small space. The city is more than 8000 feet above sea level, so it takes some time getting used to the thin air and reduced oxygen. We found that we quickly felt out of breath. (...and out of shape.) The traffic is a big concern in Bogota. There are literally vehicles coming and going in every direction. Motorcycles are everywhere and they weave in and out of traffic from all sides. 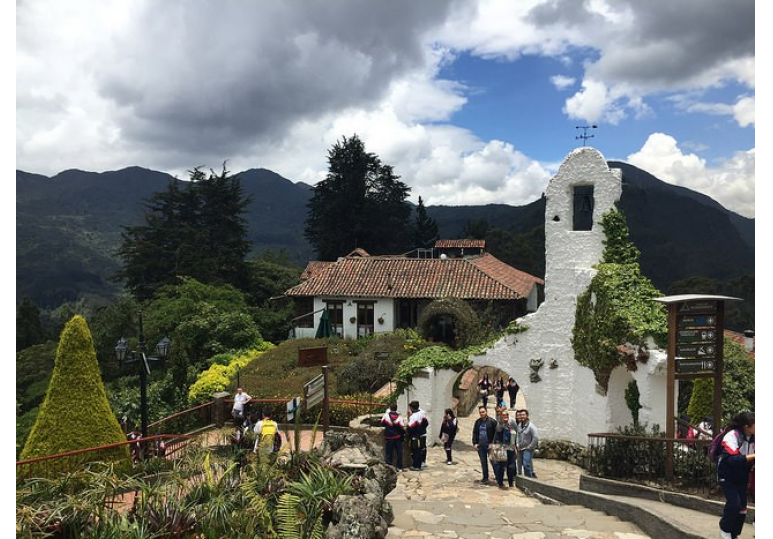 Bogota is a big and busy city but has a lot to offer its visitors. We spent our first full day in the city center of Bogota. Our first treat was to ascend Montserrate via a gondola. The top of this mountain put us another 2000 feet above the city with amazing panoramic views. There's an old Catholic church at the top and it is frequently visited by school kids from around the city and the country. The people of Colombia are thrilled to see foreigners and we sometimes felt like celebrities. Many of the school kids were eager to practice their English and some followed us around as we toured the area. Although most Colombians speak little English, they are incredibly accommodating and helpful to tourists. I know a little Spanish and am usually willing to attempt to speak it in reckless abandon. I find that my attempts were appreciated and we usually found a way to understand each other. Because there isn't much English spoken, it would be best to visit this country with a guide or learn some conversational Spanish before venturing too far. After Bogota, we spent a couple days visiting an area about 2 hours west. We stayed one night with Angela's parents, who live on a beautiful property in a rural area. This was really neat because we were able to see some banana groves and coffee plants. I now have proof that coffee is a fruit that grows on trees and is, therefore, a natural healthy drink to be enjoyed for long life and happiness. I love coffee and have always said it is one of my daily servings of fruit. We also spent 6 days touring the vast regions of the NE departments (same concept as provinces) of Colombia. Boyoca is situated throughout the Andes mountain range and has peaks and valleys that take you 3,000 feet to 10,000 feet up and down. The countryside is covered with small farms and villages. You feel like you are in the middle of a storybook setting. Every town and village has a plaza or a square in the center of town. The center of community and commerce takes place in the square. It's where people meet to visit, shop, eat, conduct business and attend church. One church was more than 400 years old. We were amazed at the way the culture has been preserved for so many generations. You get the sense that the family unit is so important and central to the fabric of their society. The roads may have been unusually busy because many people were traveling due to Holy Week. The kids are out of school and many families go on trips to visit relatives and to have a vacation. There are few long stretches of highway like we are used to, rather, the roads wind and twist through the mountain ranges. We averaged less than 50 KM/hr. I would not recommend driving in Colombia. It would be far easier to take public transportation like a motor coach, which seem to be in an abundance and much nicer than what we are used to here in Canada. The roads in the city and in the small towns are incredibly narrow and parking always seemed to be an issue. Motorcycles are everywhere and appear to be the easiest way to get around. Arepas, empanadas, pastel de yuca, plantain, potatoes, beef, pork and chicken are the mainstay of their diets. The food is not spicy and can be purchased just about anywhere. We ate at some nice restaurants and also small places on the side of the road. It is rather inexpensive to stay in Colombia. You will be hard pressed to find any chain hotels outside of the large cities. We stayed in a nice colonial style bed and breakfast in one of the most touristy places for about $75 CAN. During the busy seasons, it would be advisable to book ahead. We had an amazing trip to Colombia and would highly recommend a visit sometime. For those interested in International Living this would be a great country to consider, especially the city of Medallin. We didn't get to go there on this trip, but will definitely be where we go on our next visit to Colombia. It's the city of eternal Spring. You can see more of our pictures by clicking here.